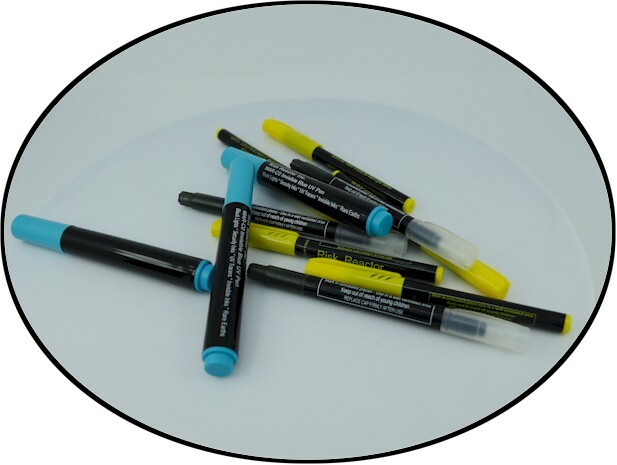 MAR-C0 invisible Blue all-purpose UV pen can be used for marking almost any type of substrate with an invisible, permanent, highly fluorescent (UV) tag for identification and tracing. The pen can be used in conjunction with our battery operated black lights to have a portable security system. Risk Reactor Inc.'s ultra violet marking pen is used extensively in numerous industries and to protect personal property. Police forces across the country gives these out to area with high stolen property crimes because all pawn shops have a UV light to scan for stolen items. Theft and the need to invisibly identify your products or personal belongings are more important today than ever. Use Risk Reactor’s Invisible Inks and special Black Lights to secure your property or product. Law enforcement around the world know the power of using invisible markings to catch criminals and get the identified property back. Business owners, law enforcement sting operations, property owners, and home owners use our tools to secure their property and future. Welcome to Risk Reactor’s Invisible Security Inks. Industrial Uses – In-house theft prevention, anti-counterfeiting and product security. Use Risk Reactor’s Invisible Inks to mark business property, tools, computers, books, equipment, etc. to be able to prove ownership and prevent lost revenue. Simply mark the surface with the appropriate ink, then use Risk Reactor’s Black Lights to view the invisible markings. You can also use these inks to secretly mark your products to prevent fraud, false returns, false re-work of parts, and many other ways businesses loose money by not being able to prove property ownership. Have you ever had to accept a returned product, because you could not prove that it was not from your business? These inks can be incorporated during the manufacturing process or post manufacturing process. Home Uses – Protect your personal belongings in your house, boat, RV, school, etc. Mark your property to prevent theft, proof of ownership, and ultimately get your property back if it is stolen. Mark your property with a unique number such as your driver’s license number so law enforcement can return it to you.